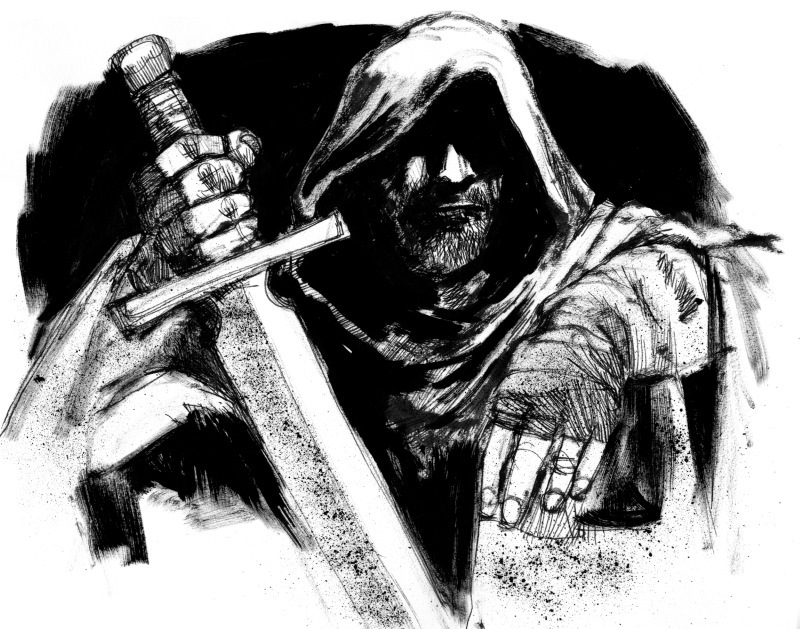 Last week, I talked about creating a ranger for Ranger sof Shadow Deep. This week, I want to look at the companions. 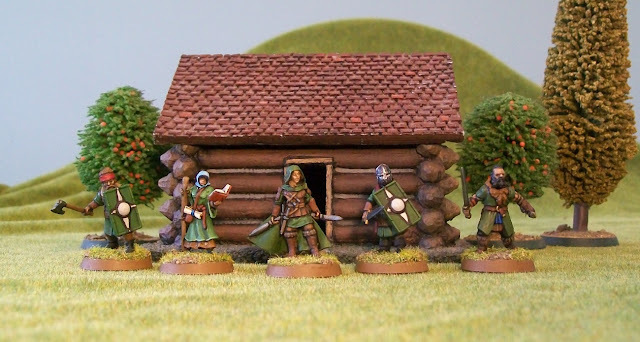 Unlike Frostgrave or Ghost Archipelago, a ranger does not have a fixed ‘warband’. Instead, before each new mission, they may select a group of companions to accompany them. A ranger can select the same companions for every mission, and there is some encouragement to do so, but it is not required. Every ranger has Base Recruitment Points (BRP) as one of their stats. This number starts at 100 and can be increased by spending Build Points as discussed last time. If you are playing the game solo, this is the total number of Recruitment Points (RP) you will have for any mission, and you can use those RPs to select up to seven companions. If you are playing the game co-operatively, there is a chart which tells you how to modify your BRP to get your actual RP for the mission. It will also tell you the maximum number of companions you have. So, when playing co-operatively, each player will have a ranger and at least one companion, but not as many as if you are playing the game solo. The rulebook contains a large list of companions, each of which has an RP cost. Each companion has their own stats, abilities, and sometimes skills. Companions include everything from bloodhounds and falcons, to rouges and guardsmen, and even barbarian warriors and conjurers. Obviously, the more powerful the companion, the more RPs they cost. While companions do not gain experience points like rangers, they do have their own, much simpler progression system. So, it is possible for the companions to improve along with the ranger, if they are taken on a lot of missions (and survive). With my ranger Aelwyn getting ready for her first mission, it is time for her to select her companions. I knew she would be going it solo, so I increased her BRP up to 120. Since Aelwyn chose not to take any spells, I decided the first thing she needed was a bit of magical support, so for 20 RP she took a Conjurer. The Conjurer can take two spells each game, or 3 if you pay an extra 10RP, but I wasn’t sure I was going to have those extra points. Next up, there are several skills that Aelwyn is lacking. So I picked up an Arcanist for 15 RP, who is skilled in both Read Runes and Ancient Lore, and a Rogue for 20RP who is good at traps, picking locks and the like. All good so far, but a bit weak when it comes to fighting. Next up, I took a couple of Men-at-Arms for 20RP each – partly because I just got a sprue of Oathmark humans and wanted to paint them up. The party is taking shape, but a little lacking in missile weapons, so for another 20RP, I selected an Archer. This left me with a total of 5RPs remaining, so Aelwyn took a loyal hound to round out her party. As a last step, I can choose one skill for each of her companions to have at +3. I won’t bother going through all of these with you. These won’t come up much, but it gives each companion just a little more character, and there are situations where it may prove useful. So Aelwyn took the maximum 7 companions. In truth, she went pretty ‘middle of the road’ with most of them, generally avoiding either the cheaper or more expensive models. This was mainly driven by the models I wanted to paint more than anything else. Once I have them all painted, these will probably be Aleywn’s usual party, at least when playing solo. Should I happen to play co-operatively, I’ll have less RP to play with, and I’ll have to rethink who I take. So there’s a quick look at selecting companions. If I manage to get the all painted, then next week I’ll see if I can give you a quick report of Aelwyn attempting her first mission. 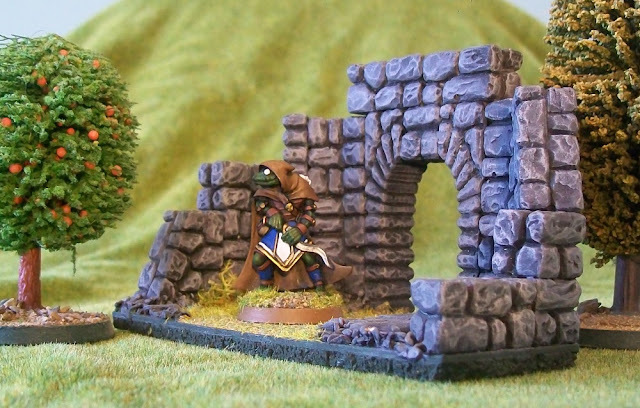 For those really interested in Rangers of Shadow Deep, I have shared a couple of other small bits and pieces on the Facebook group, so you might want to join, but all major announcements will be made here as well. As you can see, I haven’t quite finished painting them up all of the companions. The two Men-at-Arms are Oathmark Human Infantry, one with a Ghost Archipealgo head. The Archer is a Frostgrave Barbarian – if you paint them green they just look like rough woodsmen! The Conjuror is the apprentice Sigilist from Frostgrave. 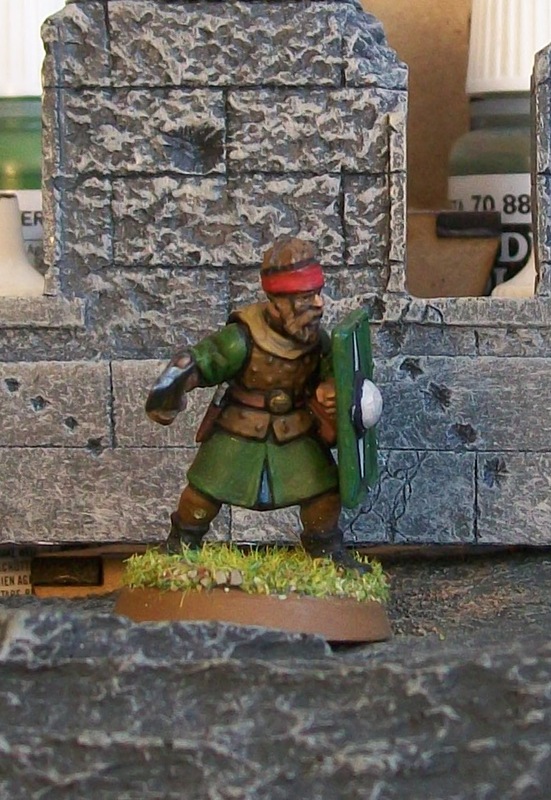 I’ve nearly finished painting the thief, who is a Frostgrave plastic soldier. I just need to find a dog – back to the box of unpainted lead! 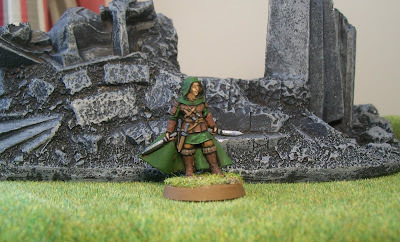 Later this week, I’m going to write a post about selecting companions for your ranger in Rangers of Shadow Deep, but in the meantime, I need to paint a few! 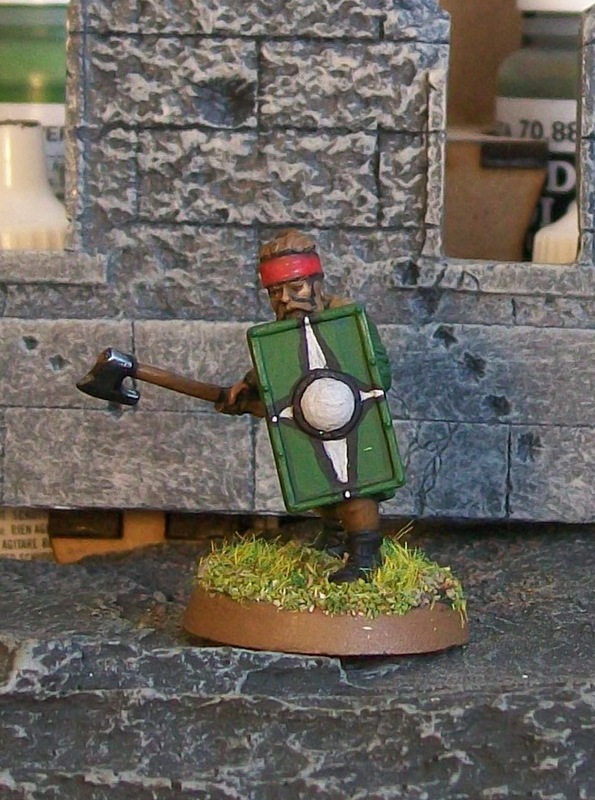 Here is my first effort, a simple man-at-arms. 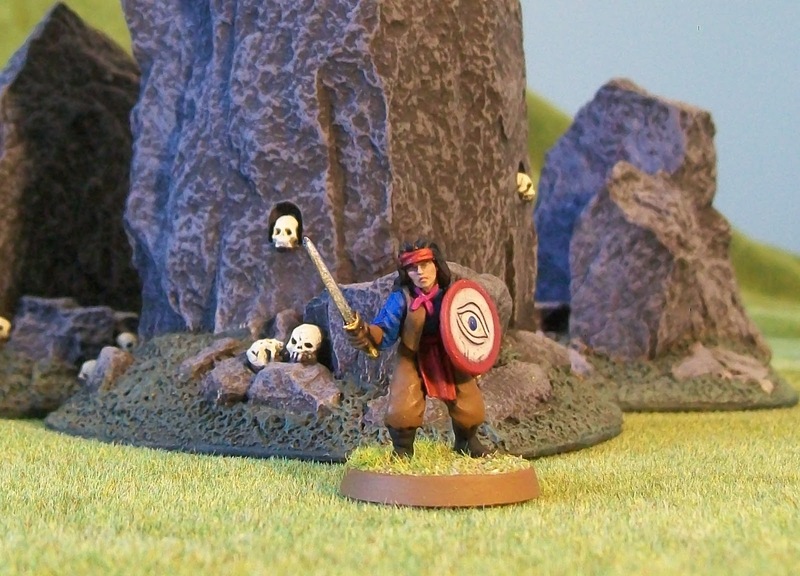 This figure is built using parts from the new Oathmark Human Infantry box, except for the head, which comes from the Ghost Archipelago Crew set. While I am biased, I’ve got to say I love the simplicity of the Oathmark set. It really is the plastic humans I’ve been waiting for. That said, I think the switch to the Ghost Archipelago head gives the figure a much more veteran look. He’s more of an adventurer than a straight soldier. On his shield I’ve painted the Silver Star of Alladore. Alladore is the name of the kingdom that now stands on the brink of The Shadow Deep (although players are free to use their own kingdom if they prefer). I’m not much of a freehand painter, but I think the star came out okay. 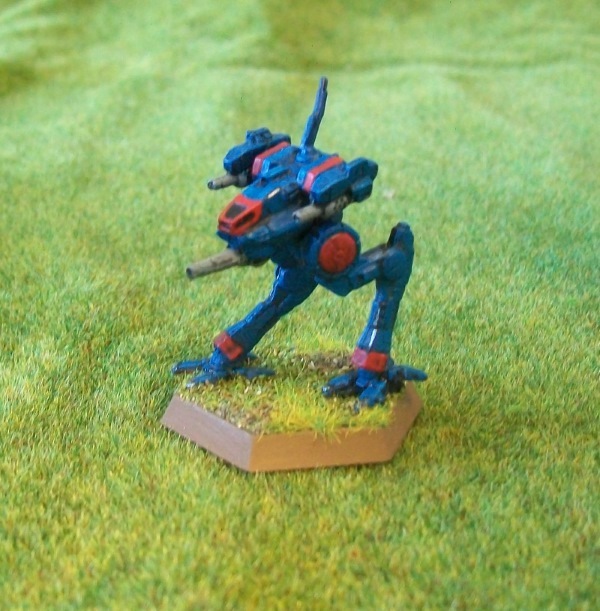 Battletech probably has the most tortured history of any tabletop game in the last forty years. I won’t go into it all here, partly because I don’t even know it all, but since the game launched in 1985 it has suffered multiple ownership changes and lawsuits, a division of its ownership with regards to the tabletop versus video game, the ‘disappearance’ of several mechs from the game resulting in the strange group known as ‘the unseen’, etc. Today the game is owned by Topps (famous for its sports cards) but licenses to Catalyst Game Labs. At the same time, in order to stay fresh, every major company development resulted in a major shake-up in the game’s ‘history’. The game now has 6 (seriously 6!) distinct eras in the history of its universe. Some people find this a real headache; others like the vast history the game covers. I’m kind of in this second camp, but I’m a very casual fan. I was there at the beginning, or near enough. I was about 9 or 10 when the game first came out. Although I never played the game a lot, its artwork, and its fiction, filled with big stompy robots blasting one another to pieces, fired my imagination. I bought a few mechs, I played a few games, I kept track of its developments. As the years passed though, I encountered two major problems in my enjoyment of the game. First, the rules just kept growing at a rate I couldn’t keep up with, until there were hundreds (thousands?) of mechs and vehicles, and scores of different weapons systems. More importantly, after the ‘unseen’ mechs disappeared, I really hated most of the new mech designs. These new mechs just seemed awkward and silly to me. More like comedy robots that giant death machines. So, for the most part, I drifted away. I still read the occasional fiction book, but that was about it. So, my first stop, on the first day of GenCon was at the Catalyst Game Labs booth, where I bought the new box set, the new source book (Shattered Fortress) and a new book of fiction. 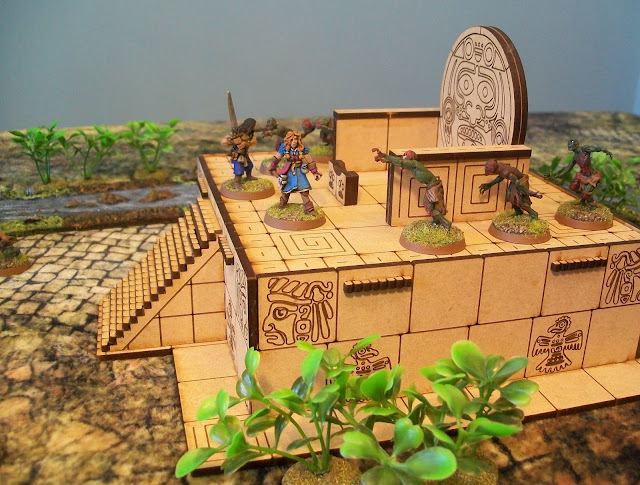 I didn’t get my first look at the minis until that night, but when I did, I was thrilled. These are the kind of mechs I had always imagined. They were fantastic. In some ways they are more like board game pieces (than classic metal miniatures), being a kind of slightly bend plastic, but they have incredible detail and hold paint well. Catalyst sold out of the new box set sometime on day two of GenCon, I believe. I have recently seen that the general launch has been delayed until sometime later this year. From what I have seen, this is the main knock against Catalyst - getting their product can be extremely difficult. Hopefully it will be out soon. Although GenCon is now a ways in the past, I’ve only just started to paint my new mechs. Here is my first one, the smallest one in the box, the ‘Locust’. It’s a great example of the new style of mech. Lots of hard edges. In truth, I have no great talent when it comes to painting machines. Most of my practice has been on 'living' things. Still, I’m happy enough with how it has turned out. Will I play the game? I don’t know. I might give it a try. I still like aspects of it, although some of the mechanics seem a bit dated to me. If nothing else, perhaps it will kick me into doing more work on the Mech War / Frostgrave variant I included in Spellcaster: Issue 2. Believe it or not, this is a Frostgrave treasure token. It was produced to go with a specific scenario in The Maze of Malcor (set in an aviary) and given away to those who purchased the book through North Star. 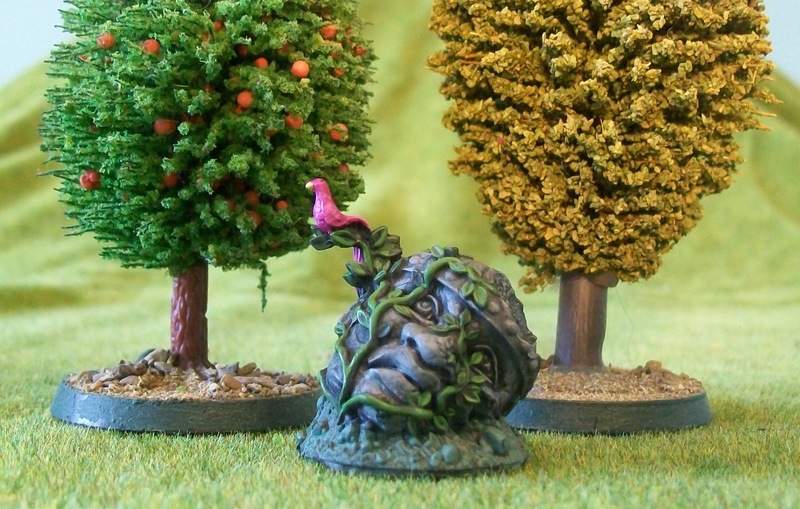 It has since been unavailable, but rumour says it will return with The Maze of Malcor figure Nickstarter that is coming in the next week or two. 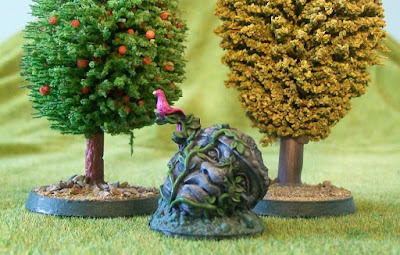 I loved painting the head and the creeping vines, but I hated painting the songbird. I made two attempts to paint it in multi-colours based on real songbirds, and both attempts were dismal failures. With the paint starting to get a little thick on it, I gave up and just painted the whole thing a pinky-purple with a yellow beak. I think it works, though I’d love to see what someone like Kev Dallimore could do with it. One of my goals when I started work on Rangers of Shadow Deep was to make the process of creating a Ranger closer in feel to designing a character for a role-playing game than to the methods commonly seen in wargames. I believe that the time you spend working on a character, and the choices you are required to make during the process, leads to a greater attachment to that character. The greater the attachment, the more the player cares about developing that character’s story and the more they care about their ultimate fate. Today, I am going to quickly run through how to create a Ranger. 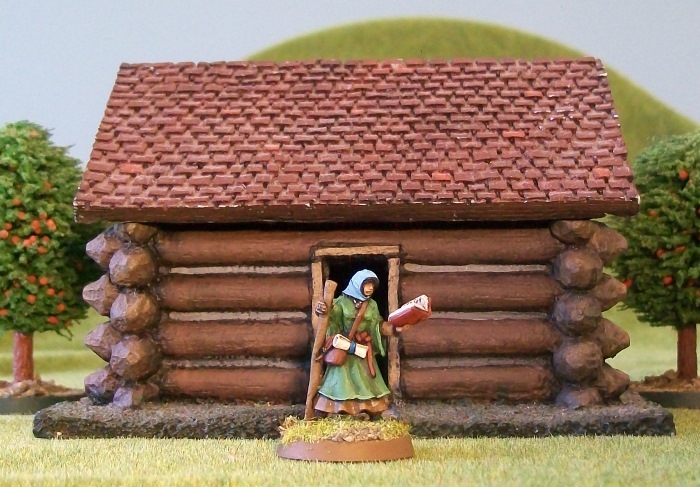 In truth, I would advise most players to start with a miniature. 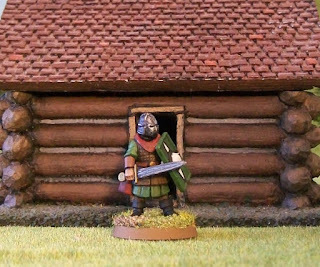 This is your chance to use pretty much whatever miniature you want to be your hero. In my case, I am drawn to the traditional ‘ranger’ aesthetic of rough traveling gear, long cloaks, and plenty of weapons. A figure that looks like it can move fast, but strike hard. 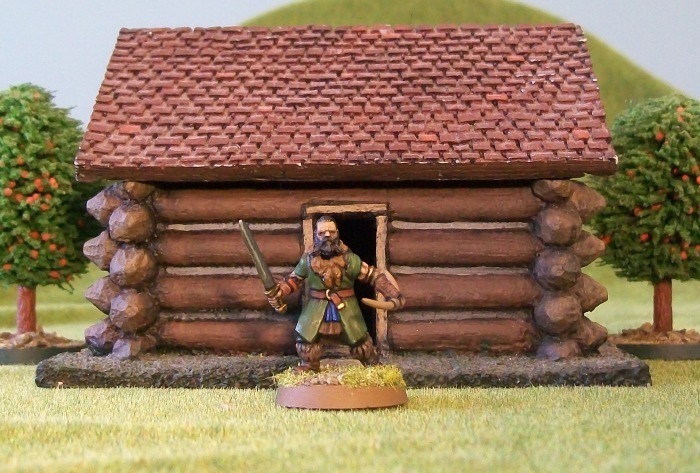 For that reason, I’ve decided to use the miniature photographed above (which is from the Frostgrave line). Don’t let the name of the game worry you too much though. If you would rather have your hero be a knight in shining armour or a crusty old mage, go for it. The rules are open enough to allow it. So, pick your favourite mini that you’ve never gotten to use, and let it guide you through the creation process. I’ve named my ranger Aelwyn, mainly because it has a bit of Tolkien feel to it. Once you’ve got your mini, and your name, you now have to decide how to spend your ‘Build Points’. Every ranger gets 10 Build Points and can use these points to improve their stats, buy Heroic Abilities and Spells, gain skills, and increase their Base Recruitment Points total. Some of these categories have limitations on how many points you can spend. Let’s start with Stats. 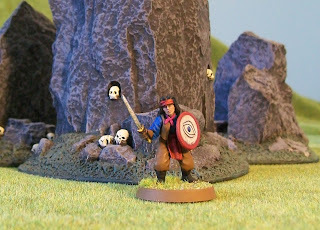 People who have played Frostgrave or Ghost Archipelago will be pretty familiar with the basic stats of a figure in Rangers of Shadow Deep, so I won’t go into the specifics here. For now, it is enough to know that each ranger starts with the following base stats. A player can exchange up to a maximum of 3 Build Points to increase the ranger’s stats (except Armour) on a one for one basis. However, you may only increase each stat once. I see Aelwyn as lightning quick, and a tough hand-to-hand fighter, so I increased her Move to 7 and her Fight to +3. I could spend one more, but I suspect I’ll want that build point later, so I’ll stop there. Next comes Heroic Abilities and Spells. These are the special abilities that really set the rangers apart from the common soldiers of the kingdom. Heroic Abilities and Spells work similarly during the game. Both are one-use abilities that allow figures to make special moves, attacks, and otherwise break the normal rules of the game. The only major difference between Heroic Abilities and Spells is that generally a figure must use an action to cast a spell, while Heroic Abilities can be used as a free action. I don’t see Aelwyn as a spellcaster, so I’m going to ignore those and concentrate on the Heroic Abilities. I’m allowed to spend up to 5 Build Points (of my remaining 8) to buy Heroic Abilities at the cost of 1BP per HA. 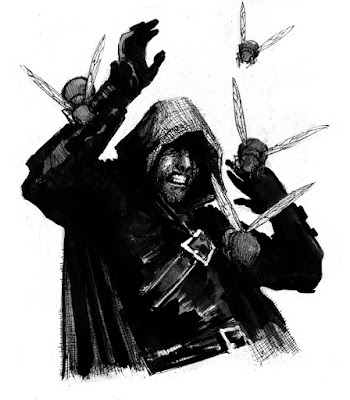 I decide to take 4 Heroic Abilities that fit with my vision of Aelwyn as the close-in fighter: Frenzied Attack, Powerful Blow, Parry, and Hand of Fate. I’ll leave it to your imagination for the moment as to what exactly those do during a game. We now move onto skills. There are 15 different skills in the game. Obviously not all of these skills will come up in every game, but all of them will be useful at some point. For every Build Point a player spends on skills, they may increase 8 skills by +1. So, your maximum starting bonus in any given skill will be equal to the Build Points you spend. After much agonizing, I decided to spend 2BP on skills, so she ends up with the following skills: Ancient Lore +1, Armoury +2, Climb +2, Navigation +1, Perception +2, Stealth +2, Survival +2, Swim +2, Track +2. This leaves me with 2 Build Points remaining. The final category is Recruitment Points. These are the points you will use to assemble your companions when your ranger sets off on a mission. Each ranger starts with 100 and each build point you spend adds +10. So, spending my last two BP gives Aelywn a 120 Recruitment Points. I’ll go through exactly how these are spent, and what Aelywn chooses to do with them next time. The truth is, you are probably going to find that you don’t have quite enough BPs to do everything you want. That is deliberate. Remember these are starting rangers. Over the course of a campaign, you’ll gain levels, and you’ll be able to improve all of these areas. I really wanted to give Aelywn more skills and went back and forth on spending 2 BP on Recruitment Points. We’ll see how that works out. My last task in getting Aelwyn ready to go is getting her equipment. All of a ranger’s starting equipment comes from the kingdom’s armoury. There is no cost to it. A ranger may carry five items. Aelwyn is going to start with light armour, a shield, a hand weapon, a bow and a quiver. The combination of light armour and a shield will increase her Armour stat up to 12. 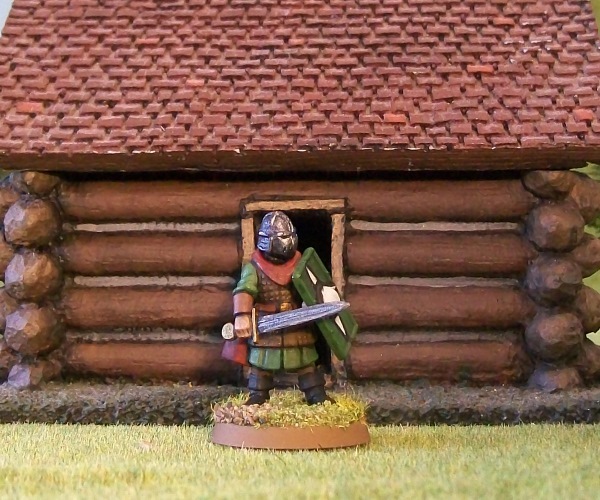 But wait, I hear someone say – the miniature doesn’t have a shield or a bow and arrow. True enough, but who cares. I assume she slings them on her back when not in combat. Rangers of Shadow Deep doesn’t care too much about completely accurate depictions. I’m playing this solo, so it’s not like I’m trying to trick anyone. 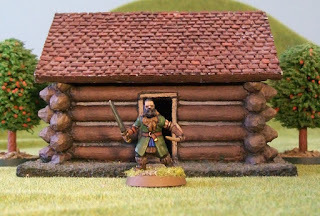 Even if you are playing co-op, everyone else is on your side, so if the info on your Ranger Sheet doesn’t perfectly match your miniature, don’t worry about it. It’s all for fun after all. So that’s Aelwyn complete. As soon as she is given her first mission by her superiors, she’ll need to round up some companions. We will look at those next time. Due to popular demand, I have created a Rangers of Shadow Deep Facebook page, where I will post a few other tidbits (but don't worry, all major announcements will be posted here). Just search for Rangers of Shadow Deep. When I started reading The Fall of Gondolin, I must admit, I didn’t like it. The narrative sort of clunks along, seemingly going nowhere, but highlighted by archaic words and other difficult to follow language. It feels very much like Tolkien himself either didn’t know where he was going with the story or was afraid to jump in and really tell it. Eventually, around the time our hero Tuor actually finds the hidden city of Gondolin the story really starts to pick up. The archaic (and I mean archaic for Tolkien) writing continues to appear, but as the narrative continues to gather pace, it becomes less noticeable. Then Morgoth launches his final assault upon the city, and I was spellbound. The battle is epic in every sense of the word. Dragons and balrogs tear through the gates; armies of elves launch counter-attack after counter-attack. Heroes fall as the lines of defence crumble. Really, if you like epic fantasy, you’ll love it. Then the narrative ends, at page 111. The next section of the book comprises 4 fragments that tell part of the story, written at different periods in Tolkien’s life, and give a glimpse on how he was shaping the tale, both to be a better story and to better fit in his greater mythology. Then comes the incomplete ‘Last Version’. This was Tolkien’s attempt to rewrite the whole story, some 35 years later, after he finished work on The Lord of the Rings. Here the hands of the Valar themselves, in ancient wars of the world’s beginning, had wrested the great mountains asunder, and the sides of the rift were sheer as if axe-cloven, and they towered up to heights unguessable. There far aloft ran a ribbon of sky, and against its deep blue stood black peaks and jagged pinnacles, remote but hard, cruel as spears. This is a master at the pinnacle of his craft! And then, just as Tuor reaches Gondolin once more, the story ends, abandoned by Tolkien. It is heart-breaking that he never finished what clearly could have been another masterpiece. 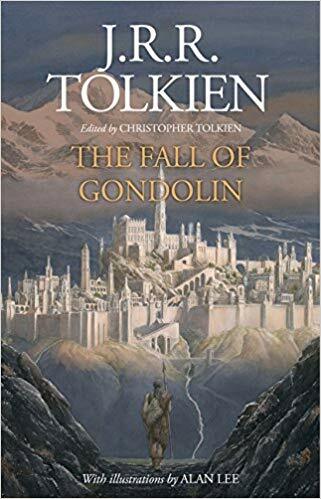 There are many who have avoided this book because it is not a complete narrative in the same way as The Children of Hurin. (See my review of that book here.) For my part, I completely respect Christopher Tolkien’s decision not to assemble such a work. While any author could take these pieces and stich them together, the differing voices, even where both are Tolkien at different stages of his life, would be jarring. It is better to present the pieces just as Tolkien left them. For myself, I have an abiding interesting in both the creative process that goes into building a story, as well as a deep interest in mythology and how mythological tales get changed and modified over time. So this book with all its fragments, and its commentary by Christopher Tolkien, was right up my alley. Not only do we get to see some of Tolkien’s best writing, we also probably see some of his worst. In some ways that is very jarring, in others, it is beautiful. I have seen a few reviews that have complained that his book contains ‘nothing new’. That may be true. I don’t claim to own every Tolkien book published, and probably couldn’t remember it all if I did. I can say, it is nice to have all of these related stories and fragments collected together so that they can be seen side-by-side, to see how the story, and the author, changed in the telling. Here it is! (Click on the photo for a bigger view.) My completed Ghost Archipelago crew. Collandra and the gang are ready for action. If I seem inordinately proud of this, you have to understand how infrequently I finish a painting project. Seriously, in order to have any hope of ever playing a wargame with figures I painted, I had to write one that only needed ten figures, and then I consistently failed to even manage that! Now to work on that ranger and companions for Rangers of Shadow Deep. My Ghost Archipelago crew was nearly done, but I just couldn’t decide on the last figure. I needed a ‘standard crewman’ to round it out, but I just couldn’t find a figure that appealed at the moment. I could have used one of the plastic crewmen, but since the rest of the crew were metal, I kind of wanted a ‘full metal crew’. In the meantime, I had this figure in my painting queue. He’s actually the cultist apothecary from the Frostgrave range. 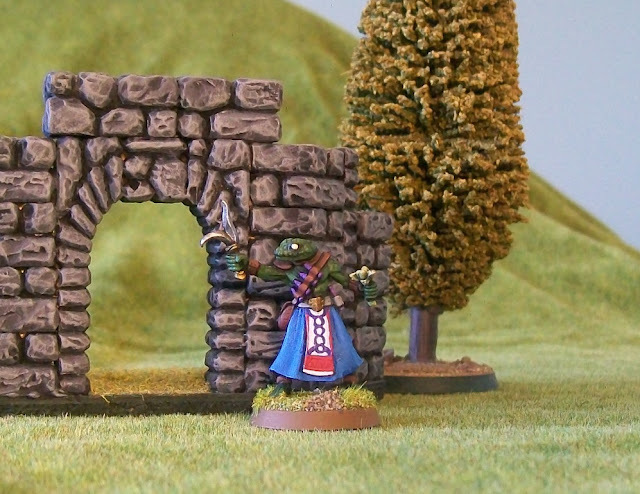 As I picked him up to paint, I realized he had a serpent pendant… It occurred to me that I was letting the game rules limit my thinking. Just because I needed a ‘standard crewman’ didn’t mean the figure had to look like a crewman. Instead, I realized what my crew really needed was a translator to help the snake-men in the party communicate with everyone else. He also does double-duty as the crew's healer. I haven’t given him a name yet, but here he is! The final member of my crew. Interestingly, I realized with the way the rules work, this guy is functionally immortal. Since standard crewman don’t roll for survival, since they can be freely replaced anyway, this guy will always come back no matter what happens to him. I think that might be part of his story, the guy who keeps getting wounded, but always survives. He wiry, but he’s tough! Now that I’ve got all ten, I’ll see if I can get them to line up for a team shot tomorrow. Congratulations to Paul Souchon, the winner in my little Wizard's Conclave cover contest. Paul correctly noted that none of the wizards on the Wizard's Conclave cover have appeared on the covers of any of the other Frostgrave expansions. Anyway, once again, I think Dmitry and Kate Burmak have turned in a stunner of a cover. The Soothsayer has obviously seen something important, but the rest of the wizards obviously don't agree on what it means! Thanks to everyone who took a guess. 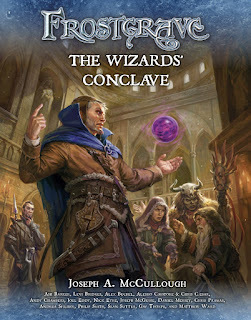 * The Necromancer has appeared on the cover of the Tales of the Frozen City fiction collection and the Catacombs of the Evrenbright Adepticon special (Available in Spellcaster: Issue 1), but never on one of the full game supplements. In both of these cases, the artwork was reused from inside one of the books. I did, at one point, consider painting up an all snake-man crew, with this guy as the Heritor, but I think it is more visually appealing to have just a few in there. Plus, considering my track record with finishing projects, I probably need to focus on just one crew and work to get that finished! As readers of Spellcaster will know, I have been quietly working on a new game that I hope to self-publish in the next few weeks. 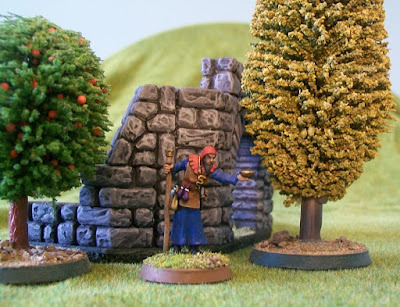 Rangers of Shadow Deep uses some of the core Frostgrave mechanics, but takes them in a new direction. 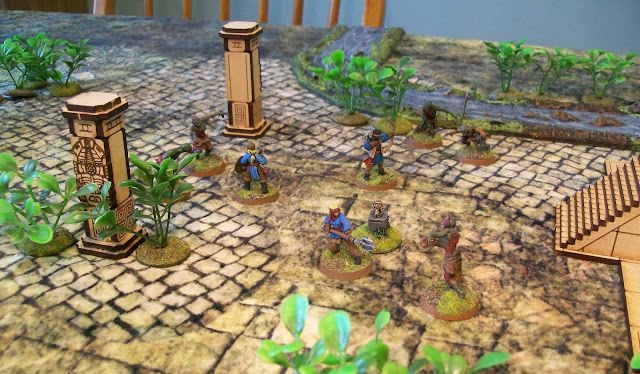 First off, Rangers of Shadow Deep is designed to be played either solo or co-operatively, with up to 4 players all taking on the roles of rangers. 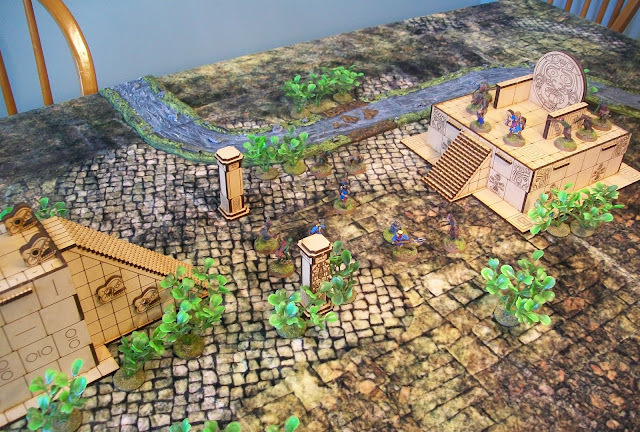 Also, while the game is still very much a table-top miniature game, it takes one more step in the direction of role-playing. Each player creates their own ranger, choosing from a host of different abilities, skills, and spells. While the players are called ‘rangers’, it is easy enough to create a character that looks more like a knight in shining armour or a devious spellcaster. You could even play a ranger who is more of an academic, focusing on skills, while letting your companions do the majority of the fighting. Every ranger also has companions, the number of which will vary depending on the number of players, but these too will have their own abilities and skills. Once the players have created their rangers, they can start playing missions. Each mission is like a mini-campaign and consists of two or more scenarios. In some cases, these will be straight-forward: play scenario 1 and then scenario 2. In other cases, each scenario has an important effect on the next one. Once the players have finished up the three starter missions in the book, they will be ready to tackle, Burning Light. This is the massive 9-scenario mission that forms the last quarter of the rulebook. During this mission, the rangers will explore the ruins of a convent in the Shadow Deep. The rangers will be able to choose what order they explore the different areas of the ruins, and the order they choose could have a profound effect on how easy or hard each scenario turns out. Each area/scenario gives the rangers the opportunity to find clues as to the resting place of an ancient artifact. Of course, as the rangers go through all of these missions they will gain experience, which will entitle them to increase their stats, abilities, skills, etc. Their companions will also progress, becoming more useful as they become hardened to the dangers of the Shadow Deep. In many ways, Rangers of Shadow Deep is the next step in the development of the Frostgrave system, but, more importantly, it is a stand-alone adventure game, where players must work together to defend their kingdom against a seemingly unstoppable darkness. I have completely finished the manuscript for Rangers of Shadow Deep, and I have all of the artwork as well. (All of it created by my friend Barrett Stanley). All of this material is currently with the designer. There will probably be a few back-and-fourths on the design, then I will give it one final editorial check, and then the game will be ready for release. I am hopeful that the game will be out in just a few weeks. 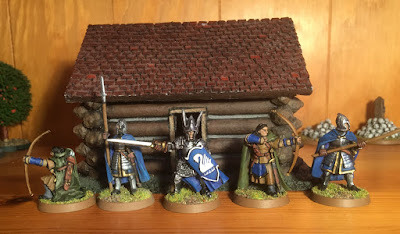 In the meantime, over the next couple of weeks, I will be showing off different parts of the game here on my blog, including creating a ranger and companions, and maybe showing off a scenario or two. I am also hard at work on the first little supplement for the game, which will both give the players a new mission to complete, and also push the whole narrative of the game forward. The game will originally be available as a PDF from RPGNow.com, or directly from me, with a print-on-demand version to follow at some future date. I hope I’ve got you interested! These days I don’t keep a very large library. I just haven’t got the space for everything I read, and, when you get down to it, most books aren’t actually worth keeping. However, I am interested in having really nice editions of the works that are important to me. This is why, when I learned that PS Publishing had published The Call of Cthulhu as an illustrated hardback book in their The Pulps Library line, I just had to take a look. The book is a slender hardback, 120 pages, 6” wide and 8.5” tall. It sports a dust jacket, with the dust jacked artwork printed onto the boards. It’s an attractive little package. 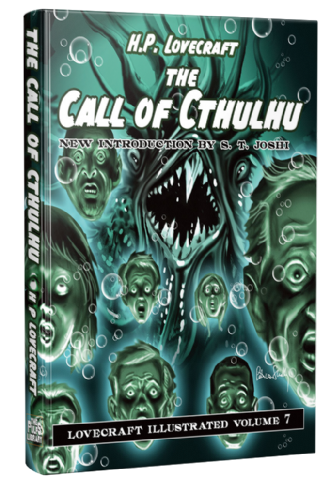 Apart from the narrative, which takes up 50 pages, the book also contains an introduction by the preeminent Lovecraft scholar, S. T. Joshi, some notes by the artist, Pete Von Sholly, and several short essays by other Lovecraftian notables on the likely influences on the story, other appearance by Cthulhu in Lovecraft’s writing, and on the making of the silent film adaptation of the story (worth seeking out if you haven’t seen it). Most of these essays have been published before, but it is nice to have them collected with the work to which they relate. The book is liberally illustrated with full-colour plates by Pete Von Sholly who has done some comic work and a lot of film story-boarding. Now normally, I prefer ‘realistic’ artwork (even when covering fantasy subjects), so at first I was unsure about Von Scholly’s kind of cartoony style. However, as I read the book, the artwork grew on me, until now, I can honestly say I like it. It’s perhaps not what I would have chosen, but I am glad that it is in there. “The Call of Cthulhu” is the seminal story in H. P. Lovecraft’s literary output, and perhaps the seminal story in the entire history of twentieth-century weird fiction. It’s a big statement, but one that I wouldn’t want to have to debate against. Picking it up and reading it again, this time in its own little book devoted just to it, I am struck, once again, by how good a writer Lovecraft actually was. There have been times, and places, where it has been popular to deride Lovecraft’s writing, and probably some of his writing deserves derision. But, at his best, Lovecraft was a very good writer, with an imagination that puts him in the highest tier of fantasy writers. 'The Call of Cthulhu' is certainly one of his best stories. For many people, only the text of a story matters, and they can read it in a book, on a screen, or scrawled on napkin. I am not one of those people. For me, the medium influences the experience. Reading a book in an attractive hardback is a better experience than reading the same work on a Ipad. I’m really happy that PS Publishing have produced this little work, and glad that I can add a copy to my library. In fact, I like it enough that I’m planning on checking out several other titles in the series. I’m continuing my work on Collandra’s new crew for Ghost Archipelago, and here is her new Warden. I knew I wanted to paint this figure as soon as I saw the digital render. He’s actually the snake-man herbalist, but he looks like he’s casting a spell to me! I made him a Vine Warden mainly because he’s holding a plant, but also because I really like some of the Vine Warden spells. Sliss will be starting with Warp Weapon, Snare, Bark, and Amphibious; which I think is a nice mix of attack, enhancement, and utility. He got the blue skirts as blue is the unifying colour of the whole crew. I made several attempts to paint his…what do you call a cloth that hangs in front like that? Does it have an name? Well, I made several attempts to paint it following the pattern sculpted on it, but this detail proved just too fine for my slowly fading eyesight. So, I just did a little free-hand. When doing the artist references for the snake-men, I said that their designs usually incorporated a lot of curves, so that’s what I went with. This guy got the benefit of the new, brush-on varnish I’m using. I am still surprised at how much better this does at preserving the actual colour painted onto the mini. It does leave the figure with just a tiny bit of shine, but not enough to bother me. A few more figures to come. Because it had been so long since me and my opponent, D, had played, and since the new edition of the rules has just been released, we decided to start our companies over. Which was just as well as Belagus, my brave knight of Dol Amroth got badly battered in our last meet-up. So, once again it was my warriors of Dol Amroth versus his Uruk-hai. I had five guys: my knight, two men-at-arms, and two archers. He had seven Uruks, including two archers. This time I decided to try something a little different and designated one of my archers (brave Eldamir) as one of the heroes. We ended up playing three games in about three hours. In the first game, I was tasked with defending a hill. I didn’t do a very good job... Although Eldamir shot down one Uruk and Belagus slayed another, we were quickly overrun and routed. Thankfully everyone survived unscathed on my side. Things were a little worse for victorious D when he found out his leader would miss the next game. Ironically, the scenario for the second game gave the victory to whoever’s leader killed the most enemies. D had to designate a stand-in. The game got off to a great start for me as my two archers combined to take out D’s new leader. All I needed for the win was for Belagus to slay one Uruk. It didn’t happen. Belagus got cut down by the first orc who crossed his path. Sigh. The game was a quick, bloody, draw. Again, all of my figures survived the fight. D, however, left one of his archers on the field. So onto the third game. D got his leader back, but was still down to six guys. I was still on five, battered, bruised, and somewhat dispirited Gondorians. The win in the third scenario would go to whoever had the most guys on the centre objective at the end of the game. The twist was that all of the figures entered the table on random sides. This led to the strange situation where Belagus and my two archers entered right behind a trio of Uruks. A sharp, bloody fight ensued. For the first time Belagus actually showed some fight, cutting down a pair of Uruks, before being dragged down himself. Eldamir also took down an Uruk before falling. At the end of the game, I had one man-at-arms standing atop the objective being charged by a pair of Uruks. However, just as they closed in, the game ended. Leaving the field and the victory to me. The win was touched with a bit of melancholy (as all tales of Middle-Earth are). For brave Eldamir fell in that battle, never again to see the ships sail from Dol Amroth. (Stupid snake-eyes on the survival roll!). Belagus also suffered a grievous wound. I rolled wounded arm, but as this would force me to get a different figure, D graciously allowed me to spend a point of Influence to change this to a leg wound instead. It wasn’t all bad in the post-game though. 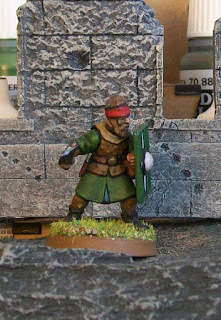 One of my men-at-arms (who really did most of the work during the three games) was promoted to a hero! Which is great if for no other reason than heroes tend to live longer. Belagus also gained a point of Might, which is super useful. Finally, with 8 Influence to spend, I decided that a Wandering Elf would join the party. This replaces my lost archer and my lost hero, and keeps my Battle Company as a small, elite force for the moment. So, three games: a win, a loss, and a draw. More importantly, a fun day at the office! Also, it leaves me with a bit of homework as I have an elf to paint! Unfortunately, I didn’t have my camera, so you’ll have to settle for a pre-game ‘team shot’. You realize you are an adult when you vacuum up a LEGO and you just don’t care. A couple of weeks ago, my parents crossed the Atlantic to spend time with the family, see our new house, and do a few touristy things here in Kent. As we wandered around, my mother commented several times about the profusion of wild blackberries. Back home in North Carolina, the birds would have picked the bushes clean. Combine this with a few other important facts. 1. Little kids love to eat berries. 3. Berries are kind of expensive. So a couple of days ago, I took a break from the writing, got an old ice-cream pot, and went on the hunt. (It is important for us pasty-faced computer jockeys to get out and see the sun now and then.) About five minutes from my house there is a massive area of wild blackberries. Within fifteen minutes I had collected a good pot full. Such a pot would have probably cost £5-£6 in a grocery store. I don’t think picking wild blackberries is a big secret or anything, but I am somewhat surprised that very few people seem to be taking advantage of this free food. Thankfully, my mother-in-law is one of them as she makes a fantastic blackberry and apple crumble. Now, how do I make jam? Just a quick update for today. Here is another crewman, I finished up to join with Big Red on her adventures in the Ghost Archipelago. It's another figure from the female crewman pack sculpted by Bobby Jackson. I thought she was looking a little plain, so I decided she needed an 'eye-catching' shield. Digging through my decals, I found this one on a sheet of hoplite shield designs. I had to cut it down to fit, but, now that its on there, it's hard to tell that it wasn't designed for it. When Ghost Archipelago was first released, about a year ago, I painted up my first dedicated crew, led by the mighty Heritor, Collandra, known to all as ‘Big Red’. While I enjoyed playing with that crew, I was never completely happy with it. Thus, amidst all of my other painting projects, I have slowly been assembling Collandra’s new crew. I started out with a new version of Collandra. Now that she’s a bit more experienced, and got a bit of money, she’s decided to dress a bit better. Plus, I decided I would use the colour blue as a unifying them for the crew. So far, I've painted half of them. I’m still deciding on the rest of the crew, but I think I’m going to say that in her travels she befriended a group of snake-men outcasts. I really want to use the snake-man herbalist as my Warden, and one of the snake-men Heritors as a scout. In the meantime, here is the first half of the crew investigating some jungle ruins, and finding more than they bargained for! The scenery is by Things from the Basement. They do a lot of MDF terrain themed for Frostgrave and Ghost Archipelago in their ‘Buildings on a Budget’ range. They are really nice pieces. The hyper-cool matt is from Cigar Box Battles. It took me a while to get to use this matt, as on its arrival, it got swiped by my wife and kids to play with dinosaurs. Then, it spent a long time in the living room serving as the blanket for the sofa. I’m not kidding, the matt is actually that large, comfortable and warm. It is also double-sided, and looks fantastic. I’m sure Collandra and crew will have no problem with a few stray zombies, but she’d going to need some more help if she’s going to continuing venturing deep in the Archipelago!